There is more than enough fresh water in the world for domestic use, agriculture and industry, however, the poor are largely excluded from this globally recognized “human right.” The millions forced to collect water from drains, ditches and streams suffer a deprivation that threatens life, destroys opportunity and severely undermines human dignity. This is the problem, and it can all be avoided. Across much of the developing world, “unclean water is an immensely greater threat to human security than violent conflict”1. Sadly, children’s vulnerability makes them the greatest bearers of this tragedy. Each year an estimated 2.2 million children die from diarrhea2 and 443 million school days are lost to water-related illnesses1. Most notably this crisis could be prevented by the provision of three fundamental foundations of human progress: delivering clean water, removing waste water and providing sanitation. Rural peoples harbor the majority of this cruel, subtle crisis. The African continent faces the greatest challenge of any region of the world with roughly 1 of 3 (330 million) people not using a clean water source. Eighty-four percent of these people live in rural areas. 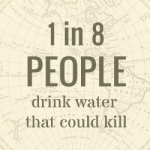 This represents an increase of 66 million people since 19905 who do not have a clean water source. Unfortunately, aid commitments for solutions targeting rural populations are declining while aid for urban solutions has increased 60% since 20006. As a result, on any given day more than 50% of hospital beds in Sub-Saharan Africa are filled with water/hygiene related illnesses6. In rural settings it is traditionally women and young girls who bear the responsibility of obtaining their family’s water supply. In Sub-Saharan Africa, 68% of the rural population spends more than 1 hour per trip of water collection3. That means valuable time, sometimes upwards of 3 hours a day, is lost collecting insufficient, contaminated water. Ultimately, a woman’s opportunity in education or small business ventures are entirely inhibited with this strenuous work. The solution, while surprisingly straightforward, is critical for developmental progress. When implemented—the comprehensive approach of providing water, sanitation and hygiene together—has profound impact on the communities involved. In-terms of direct economic reward, every dollar invested in water and sanitation yields a $9 return7. While the UN suggests that a person’s basic needs can be met with a mere 20-50 litres (4-10 gal) of safe water8, WWFA is committed to establishing and maintaining a holistic and integrated approach. The impact is one for life. Now that you know about the problem, you can improve and save lives NOW from right where you are! Your donation of any size WILL help bring clean water to people in need.